During winter, many families must ask themselves one all-important question: Where shall we go skiing with the kids? Sure, there are plenty of suitable options in Austria and Switzerland, but it’s never an easy choice betweeen all of them. Families require certain amenities and conveniences, like having hotels near the ski-lift, or a playroom at the top station, or a children‘s area to learn skiing. If you go skiing in Ischgl with children, luckily, you can have it all. 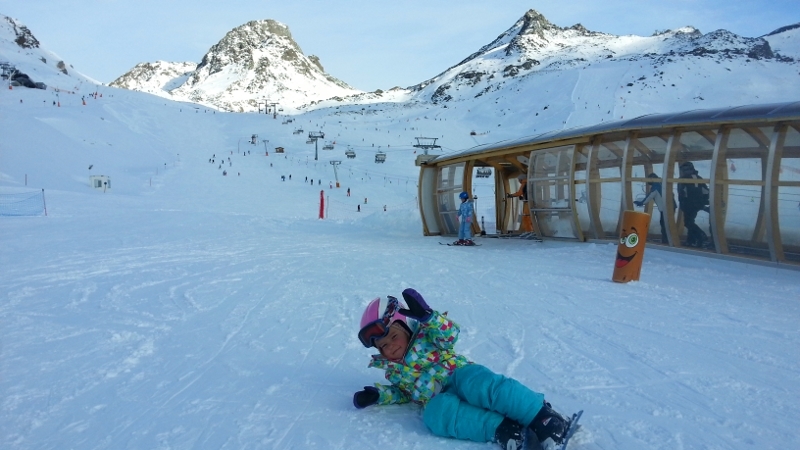 Our kids are 3- and 5-years-old now, and we first visited Ischgl in Austria when the youngest one was only one-and-a-half-years-old—not exactly the best age for a skiing holiday. She had just learnt to walk on her own, so she was far too young to learn skiing in Ischgl that trip. The older one was three-and-a-half and keen on skiing. Therefore, we decided to give it a shot. So began our two week trip skiing in Ischgl with children. If you drive up ing the telpher from Ischgl village to the top station at Idalp, you’ll arrive perfectly in the center of it all. Everything in the skiing village is built around the Idalp. If you need a restaurant, a bar, a ski school or simply one of the ski lifts, this is the place. 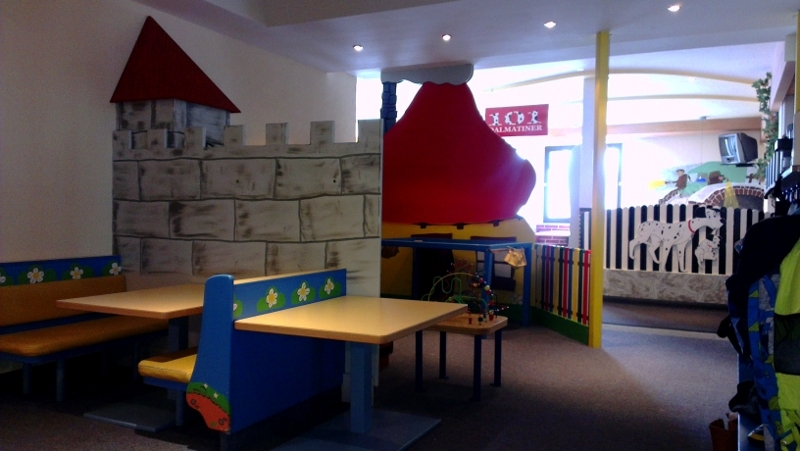 There’s even the kindergarten and the aforementioned playroom right there as well. Although the kindergarten costs 18€ per hour, it offers parents the option to spend some alone-time on the slopes. Opposite the Idalp is the children’s skiing area, complete with a magic carpet device to make skiing as easy as possible. Ski instructors take kids over three years of age through a step-by-step training regiment. Nevertheless, it’s possible to use the magic carpet for yourself or your children even if neither of you are taking part in the ski school itself. Even children who already know how to ski may get a kick out of it. The Idalp operates via chair-lifts and drag-lifts. 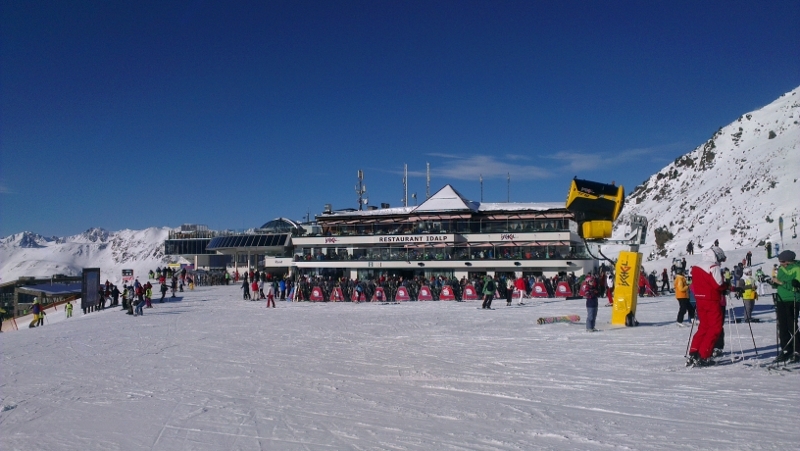 When skiing in Ischgl, beginners, experts and pros alike have accomodations to have a great time. 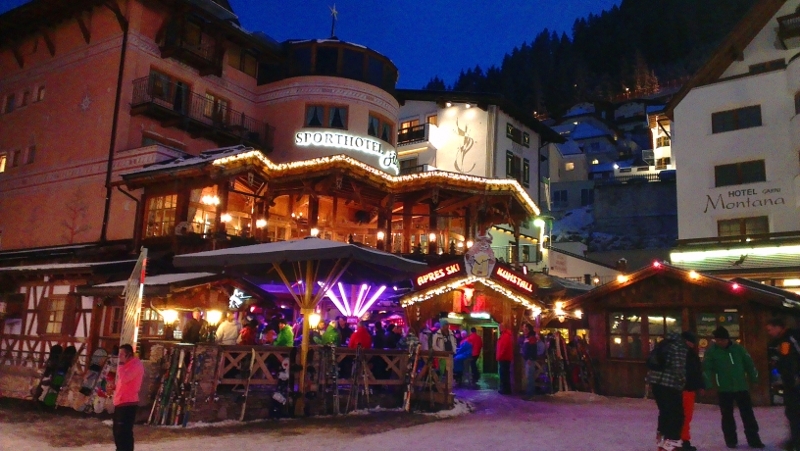 Ischgl runs different events throughout the year, including the ski opening and closing parties, which attract starring guests like Robbie Williams. Casting shows have events up there and even artists occasionally show off their talents in creating snow statues and ice sculptures. The lifts close at 4 pm, the telpher at 5pm. So what can you do with the long afternoons after spending the day skiing in Ischgl with children? Right at the bottom area of the telpher are different Apres Ski locations. It may as well be Austrian or German tradition to meet for a drink or two after skiing. This tradition is perfected in Ischgl. Several locations invite you to leave your skis or snowboards at the coat check, and enter a new world of warmth, of Apres Ski songs, of mulled wine and hot chocolate. Children under 14 are allowed to stay with parents until 10 pm in the restaurants and clubs. Perfect for Apres Ski, since most clubs are already open by 1 pm. 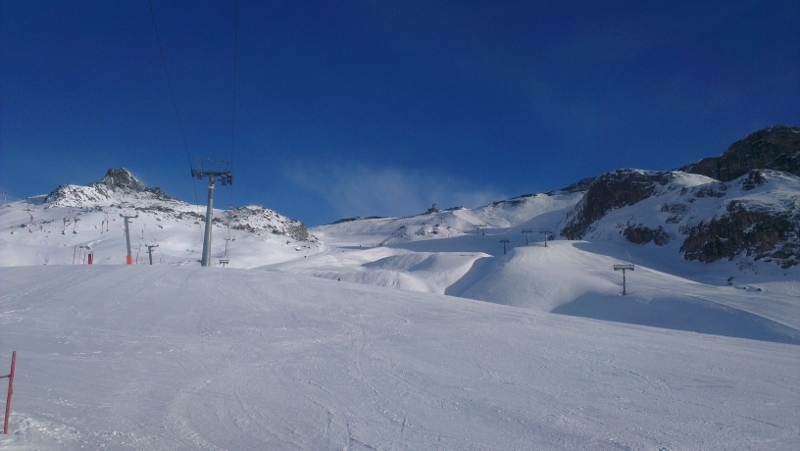 We tested the Kuhstall at Apres Ski location for you. It’s next to Nikko’s Hexenstube and opposite of Fire&Ice – both Apres Ski Clubs. The Kuhstall is famous for its Austrian decor and long history. Numerous well-known DJs play here to help ensure the party is always going. There’s an outside area with standing height tables to help some guests escape the thumping music if they choose. Inside, the several bars and tables are all made in Austrian wood-style. The music is louder, as the dance floor is located in the middle of the club. How is the Kuhstall with kids though? Most people we spoke with said they love seeing children there, because there’s nothing bad or inappropriate about simply dancing. They even danced with our kids and kept them entertained. But I will say this—you must have a certain attitude of educating your kids. I want to show them the world how it is. There are people drinking alcohol, so what better time to explain why? People are dancing, talking to strangers and the music is a bit louder than usual. Okay, no problem with that. I want my kids to see me having fun, to see how we celebrate life, and clubbing is often a part of it. If certain activities are not allowed kids tend to try doing them secretly. The attraction of going out with a 14-year-old child, drinking vodka and telling me she sleeps at a friend‘s house, is much higher than doing so with my 5-year-old in the clubbing scene. It’s completely normal for her, and I want her to have loads of self-esteem, knowing she can tell me where she goes without being naive and blind to the experiences of clubbing. We went home at 7 pm to cook a relaxing dinner while the children played around the facility. 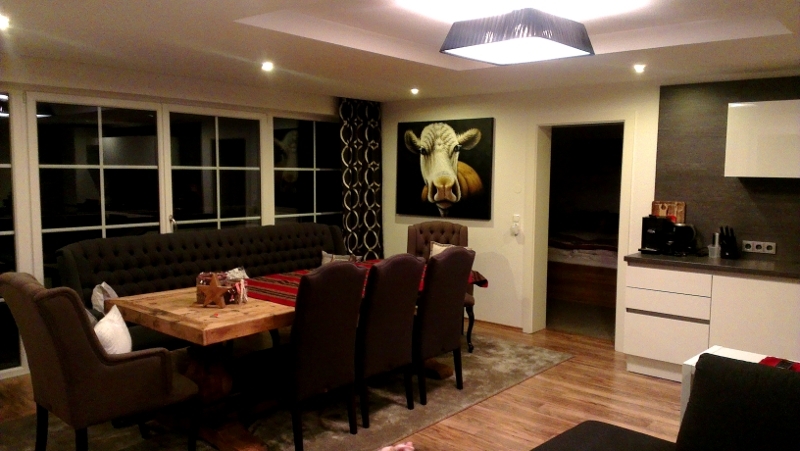 The wonderful Avenzio Apartments in Ischgl are ideal for families, as they provide a lot of space and virtually everything you need to enjoy the winter holiday, only 7 minutes away from the telpher in Ischgl. We loved their bread-service in the morning and the meticulous yet homey interior design. Martina is a lovely host who works hard to make your stay perfect. All these aspects make Ischgl perfect for a family adventure. 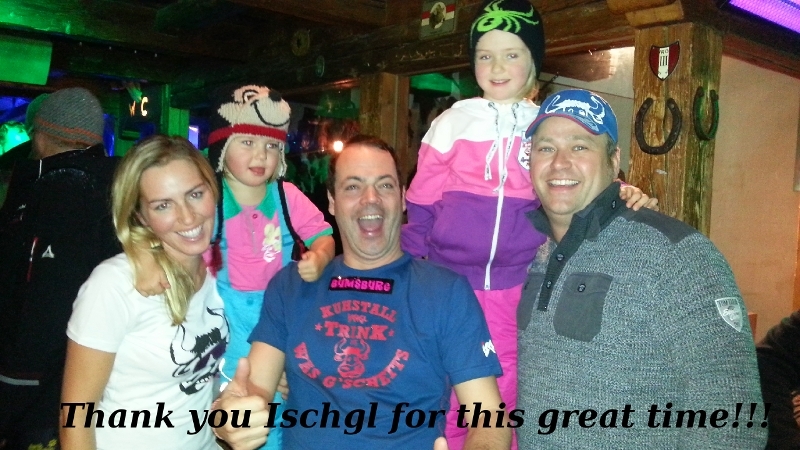 We will certainly go skiing in Ischgl with the kids again, and once again head to the Kuhstall for a good time after the lifts close. Our children are already asking to go again, so it’s safe to say they loved it as much as we did. I saw your photos from your travelings. Your kids are lovely. And your husband looks energetic and fun although I didn’t see much photos of him. May be he is the one who always is behind the camera! I got familiar with your blog by listening to your interview on FamilyAdvernturePodCast. That was a great interview. My name is AbdolHosein but please call me Meysam. I’m from Iran. I haven’t done much travelling but I love getting familiar with other people worldwide. So if you ever decided to travel to Iran, I’d love to host you in Yazd and take you to near by cities around Yazd in centeral parts of Iran. I have two kids. A girl who is 9 and a boy who is 1 year old. Ok great to your weblog and I hope I hear from you back. so lovely you got in touch with me! Until now we haven’t been to Iran, but if we do I’ll be more than happy to meet you. Do you follow me on facebook already? I have loads of pics there. Thanks for this post. We have been skiing in Austria for 10 years now, but we have a toddler now 🙂 she is 2 and a half now and you gave us some options. Very grateful!